David A. Duke, a University of Utah College of Engineering graduate, former chief technology officer with Corning Inc. and an inductee in the National Academy of Engineering, passed away Monday, Oct. 9, of natural causes. He was 81. Duke graduated with a bachelor’s in geology and geophysics in 1957, and a master’s and doctorate in geological engineering in 1959 and 1962, respectively, and was a fierce supporter of the U’s College of Engineering throughout his career. 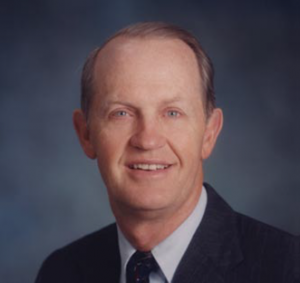 He was a member of the College’s Engineering National Advisory Council for 13 years and was a generous benefactor, providing financial support for the construction of the Warnock Engineering Building as well as for the David A. and Hanne J. Duke Scholarship in Materials Science and Engineering. Duke was born and raised in Salt Lake City and attended East High School before enrolling at the University of Utah in 1953. Upon graduation, he started working for Corning as a research scientist, a company he would stay with for 34 years. During that time, he was awarded 10 patents, most for Corelle dinnerware. During his tenure with the company, he attended Harvard Business School’s Professional Management Development program and then was put in charge of several of Corning’s businesses, including those involving science products, Radomes, catalytic converter substrates, and telecommunications/optical waveguides. In 1988, he was elected vice chairman and chief technical officer of Corning and was a member of its board of directors. He retired from the company in 1996 and was living in Park City with his wife, Hanne. He accepted the National Medal of Technology from President Bill Clinton and Vice President Al Gore on behalf of Corning, and he later received the Earle B. Barnes Award in Chemical Research Management by the American Chemical Society. He was inducted into the National Academy of Engineering in 1992. During his career, he served tirelessly for others, mentoring colleagues at work, counseling families through his work with the Church of Jesus Christ of Latter-day Saints, and encouraging youth to pursue their professional goals. Away from work, Duke served as an LDS branch president and bishop in Elmira, N.Y., and was president of the South Africa, Durban LDS Mission from 1998 to 2001. Duke is survived by his wife of 62 years, Hanne; their four children, Katherine (Robert) Shumway, Michael, Deborah (Gregg) Winn and John (Cessily) Duke; 20 grandchildren and four great-grandchildren. A public viewing will be held Friday, Oct. 13 from 6 to 8 p.m. at the LDS Olympus Stake Center, 2675 E. 4430 South, Salt Lake City. A funeral service is scheduled for Saturday, Oct. 14 at 10 a.m. at the LDS Park City Stake Center, 2300 Monitor Dr., Park City. In lieu of flowers, please send donations to the Perpetual Education Fund of the Church of Jesus Christ of Latter-day Saints at http://give.lds.org/pef or to the David & Hanne Duke Scholarship Fund at the University of Utah College of Engineering at https://umarket.utah.edu/ugive/level4.php?catid=82.